Silicon Valley may be the startup center of the universe, but it’s far from alone when it comes to a concentration of good ideas. Innovation and creativity aren’t confined to any one place, and the startup hub idea that has taken root in the Valley can be replicated in other areas of the country and world with effort and commitment on the part of entrepreneurs, government and a whole slew of economic constituents. Finland offers one such place where, unbeknownst to many in the US, there is a thriving startup scene that extends all over northern Europe — in Helsinki, Stockholm and Copenhagen and beyond. What’s more, there are companies popping up in Estonia, Lithuania and across the Baltics. It might not be as vast as San Francisco, New York City or even Boston, but the energy is palpable and the enthusiasm extensive and it was on display last week in Helsinki at the Arctic 15 Conference. One of the impressions I took away as I walked the conference and spoke to the various companies on the conference floor, was that these entrepreneurs are every bit as committed to success as anyone in the US, but there is the ability here, because of the small community, to quickly develop a position of influence and to become the connective tissue that is needed to build a startup community. The Arctic 15 business, which is far more than the conference itself, is indeed part of that system. It provides news coverage through its various publications. It organizes smaller gatherings beyond the showcase conference last week and it supports the ecosystem in a variety of ways, not unlike TechCrunch has in the Silicon Valley — albeit on a smaller scale. The goal of any startup community is to do more than simply provide the support system for startups to develop. It wants to seem them grow and thrive and while you might not see the pure dollar success stories we have seen over the last two decades in the US, it’s a system that’s on its way and has seen its share of decent exits. 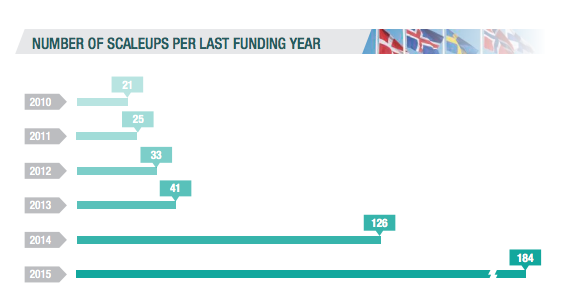 According to the Startup Europe Partnership (SEP), a think tank established by the European Commission that has studied startup activity in Europe since 2010 (pdf report), the Nordics compromised of Sweden, Denmark, Finland, Norway and Iceland have done remarkably well compared to the rest of Europe, especially when you consider how much smaller the populations are in this part of the continent. SEP was looking to quantify the growth potential of the Northern Europe startup community and what it found was quite startling. SEP looked at the biggest companies in the Nordic startup scene, what it calls Scalers — those who have been able to secure at least $100 million in capital — and identified 12 such companies including Spotify, Zendesk, King.com, Klarna and iZettle. It also identified scaleups, companies that have raised at least a million dollars and it found 430 such startups across the northern region with Sweden and Finland leading by a large margin with 149 and 126 respectively — and the good news is they found it’s been growing each year. One area that needs to build up at some point is funding mechanisms. While there are firms working at the angel, seed and A round levels, there’s not much beyond that at the local level, I was told. That means firms from outside the region need to fill in. Perhaps that’s why Tim Draper from DFJ and Draper and Associates, Seth Pierrepont from Accel, Megumi Ikeda from Hearst Ventures, Carman Chan founder of Click Ventures and many others showed up to find what was happening here. They weren’t alone. Hala Zeine, SVP in charge of portfolio at SAP was also there speaking to startups and looking for ones that would be good matches for her company. She told me she came away with some viable candidates and would be following up in the coming weeks. The center of the conference is not the speakers on stage as at so many, but relationship building. They spend more time trying to get people to connect than sitting watching someone speak and there were meetings everywhere in every space from formal meeting spaces designed specifically for that purpose to hallways and informal seating areas. People just kept chatting. One sure sign that the startup scene is thriving in Finland and Northern Europe is that young people consider startups cool. One young man bragged he worked for a startup, but when pressed for details, he really had kind of a vague idea for one. He simply liked the idea of saying he was working on it. Finland showed me that in the coldest parts of Europe, the startup scene is pretty hot, and has plenty of activity to brag about. What’s more, it has the potential to be an economic force for years to come, providing jobs and driving growth in the region and beyond — and that’s exactly what a startup scene should be doing regardless of location.